I the last couple of releases I always posted the pages where you could get the list of Recommended Hotfixes and Updates for Windows Server 2012 Failover Clusters and List of Hyper-V and Failover Cluster Hotfixes for Windows Server 2012. I want to upgrade the post with the links for Windows Server 2008 R2, Windows Server 2012 and Windows Server 2012 R2. 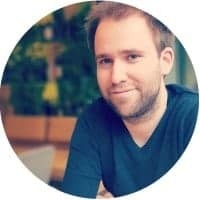 So you can find all updates from a single site. 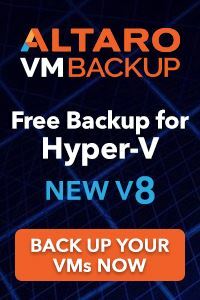 Feel free to share this page and I always recommend to get the latest hotfixes when you are deploying a new Hyper-V or Scale-Out File Server environment. And definitely check also Aidan Finns blog from time to time where he does some deeper look at the Knowledge Base articles for Hyper-V. 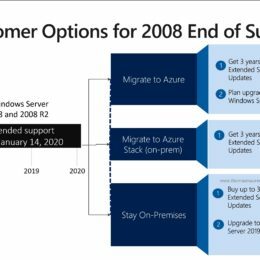 If you have already an existing Windows Server 2008 R2 Hyper-V cluster and you want to upgrade to Windows Server 2012 you have two options. The first one is by moving all virtual machines via System Center Virtual Machine Manager from the old Cluster into a new cluster. 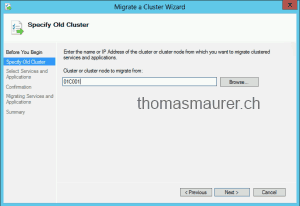 The second way to do it, is to use the Cluster Migration Wizard which is part of Windows Server 2012. In my case I have two clusters one “old” Windows Server 2008 R2 Hyper-V cluster and my new Windows Server 2012 Hyper-V cluster. 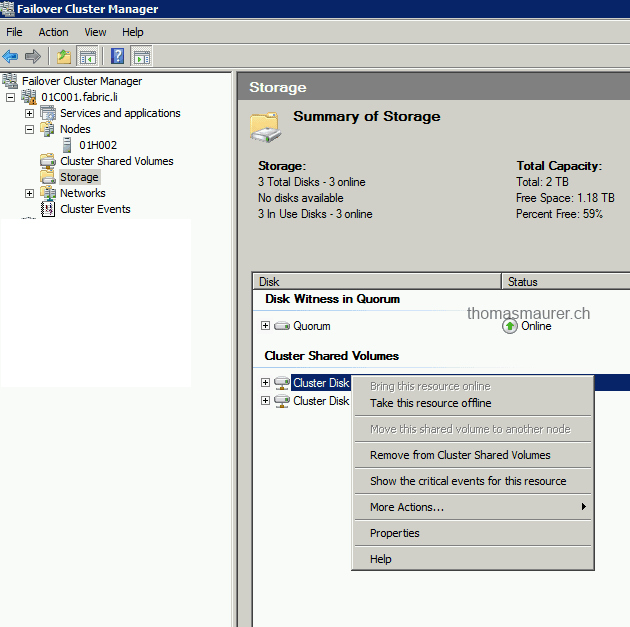 Both Clusters are fully configured and both have access to the same disks/LUNs. The disk and all the VMs are running on the old cluster. 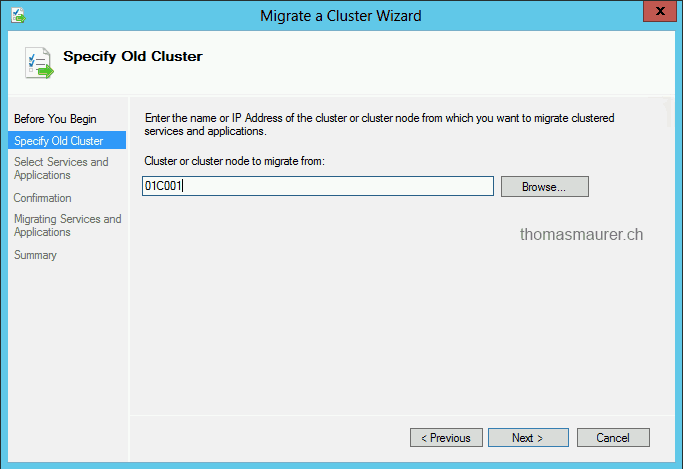 On the new cluster you can start the Cluster Migration Wizard. 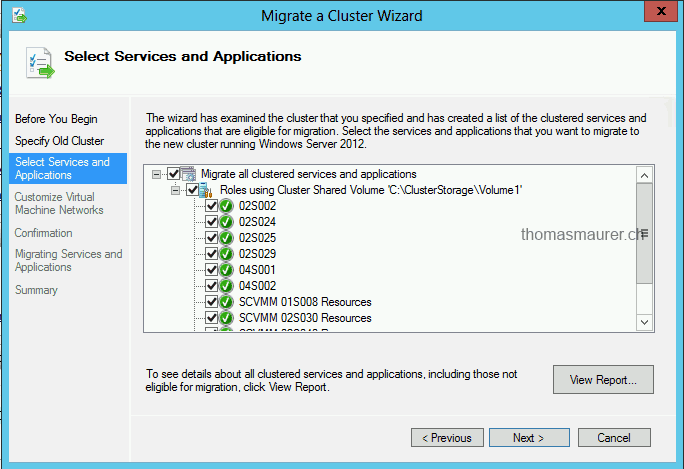 This will bring up the Cluster Migration Wizard. The wizard will ask you about the old cluster. 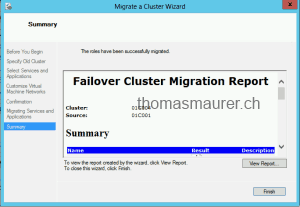 The Cluster Migration Wizard will scan the old cluster for CSVs and Cluster roles. 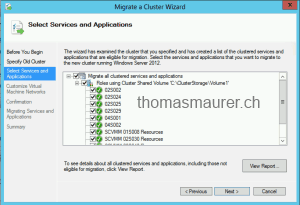 You have to select the Cluster Shared Volume you want to migrate to the new cluster. 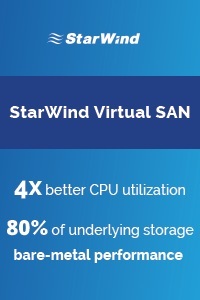 Note: you can only migrate CSVs including all virtual machines running on this CSV and not just single virtual machines. 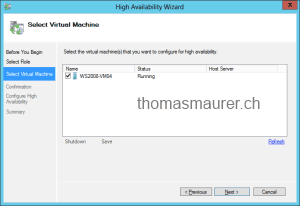 If you want to migrate single virtual machines you could do a Hyper-V Export/Import or using System Center Virtual Machine Manager. 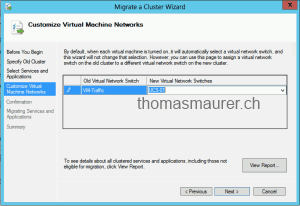 Since the Cluster Migration Wizard detects the roles as Hyper-V virtual machines he also asks for the new Hyper-V Virtual Switch. You get a quick summary with all the information what the Migration Wizard will do, and you can migrate all roles. 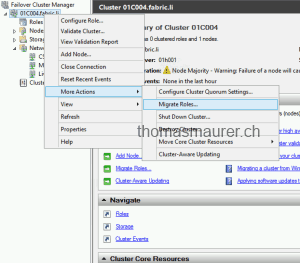 This means the Migration Wizard will create all cluster roles on the new cluster but will not take the existing VMs offline the VMs at this point are still running on the old cluster. 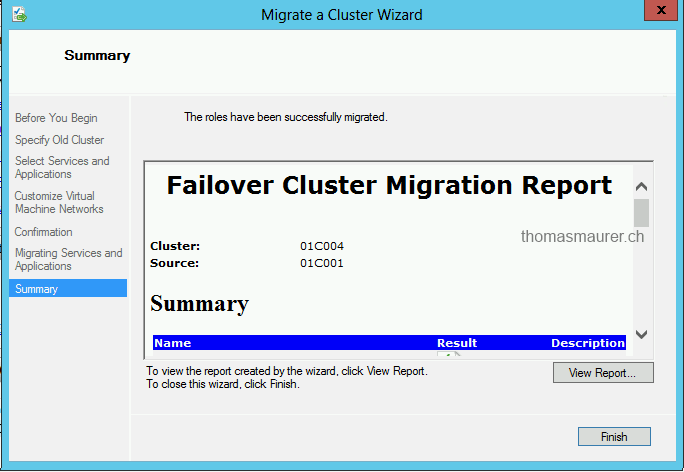 You also get a Failover Cluster Migration Report at the end. All the clustered services and applications selected for migration were migrated successfully. You may now take the clustered services and applications offline in your old cluster. Also take offline Cluster Shared Volumes used by any migrated roles, as well as storage pools for virtual disks used by any migrated roles. Then these disks, Cluster Shared Volumes, and clustered services and applications can be brought online in your new cluster. In the new cluster you can now see the roles which are all turned of because there are still running on the old cluster. And you can also see the CSV which is offline on the new cluster and online on the old cluster. As already mentioned we had no downtime until now. 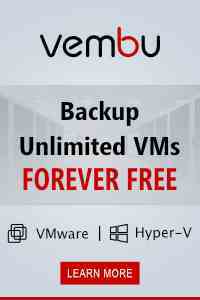 Now you can go and shutdown all the virtual machines running on your old cluster and take the migrated CSV offline. 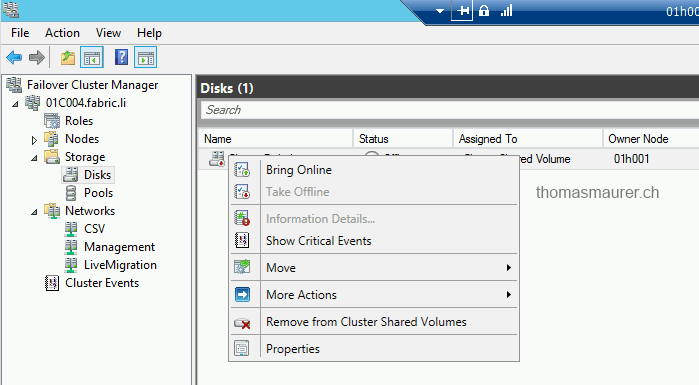 Bring the virtual machines on the new cluster back online. 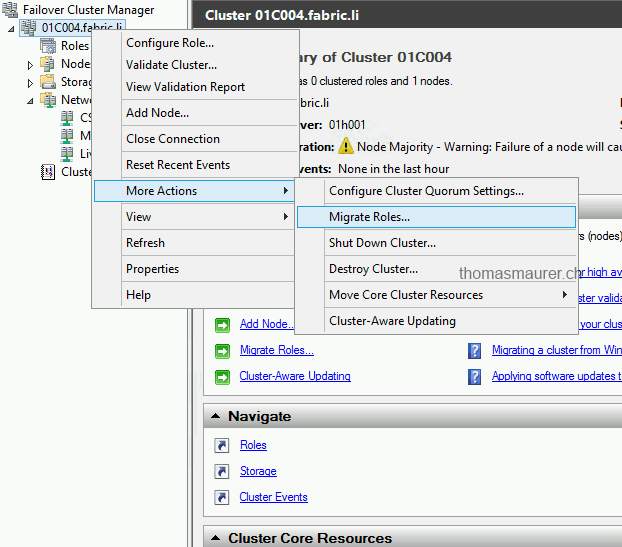 And this is more how you can migrate a cluster. Remember there are still some tasks left. Upgrade the Integration Components of all the virtual machines to the newest version. Convert all VHDs to the new VHDX format to dynamic disks. There is also a great video from Symon Perriman and Rob Hindman, a Program Manager on the Windows Server Clustering & High-Availability team, in which they explain how you can upgrade to Windows Server 2012 Hyper-V. 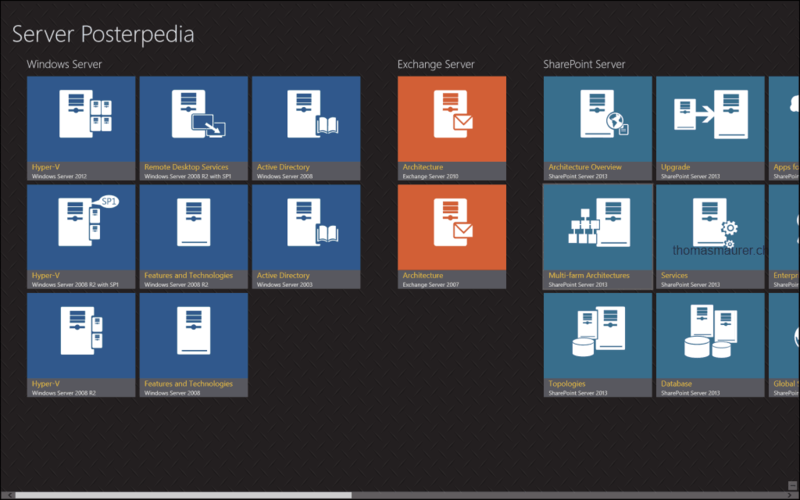 I know for a lot of people this is not something new, but in the courses I presented in the past weeks I always mentioned this great Windows 8 App called Server Posterpedia. Server Posterpedia is an interactive app that uses technical posters as a reference for understanding Microsoft technologies. This app includes all the reference posters from different Microsoft Server Technologies such as Windows Server 2012 Hyper-V, Exchange or Windows Azure. The great thing about this App, you can not only checkout the different posters and zoom in, if you click on a specific topic for you get directly linked to the right TechNet article. This can help find some TechNet references really easy and fast. 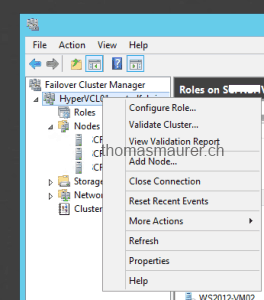 If you have a running Hyper-V Virtual Machine with is not part of a cluster you can make this virtual machine highly available via the Failover Cluster Manager. First of all the Virtual Machine has to be stored on a shared storage. 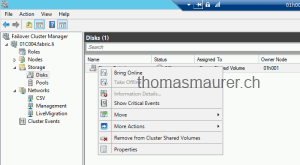 In Windows Server 2008 R2 this means the Virtual Machine and the attached Virtual Disks had to be stored on a Cluster Shared Volume (C:\ClusterStorage\…), with Windows Server 2012 the VM could also be stored on a SMB 3.0 file share. And there is also a big difference in Windows Server 2008 R2 Hyper-V and in Windows Server 2012 Hyper-V. 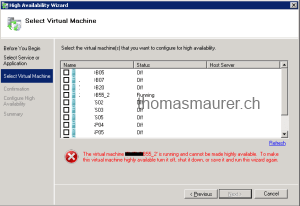 In Windows Server 2008 R2 the Virtual Machine had to be offline during you add the VM to the Cluster, and in Windows Server 2012 you can do this online. This started the High Availability Wizard. 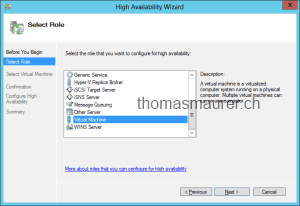 First select the role you want to make high available, in the Hyper-V case this is “Virtual Machine”. 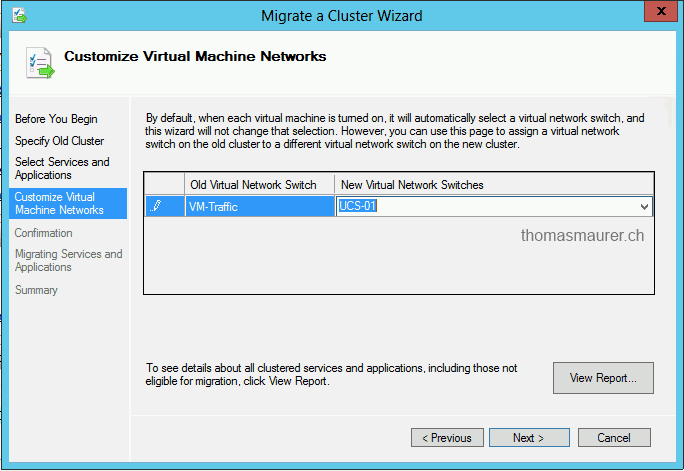 Now select the Virtual Machine you want to add to the cluster. Note: In Windows Server 2012 the Virtual Machine can be online, in Windows Server 2008 R2 the Virtual Machine had to be offline. After clicking next on the wizard, you the VMs will be added to the Failover Cluster. Btw. thanks to Philipp Witschi (itnetx), who I now owe a dinner. 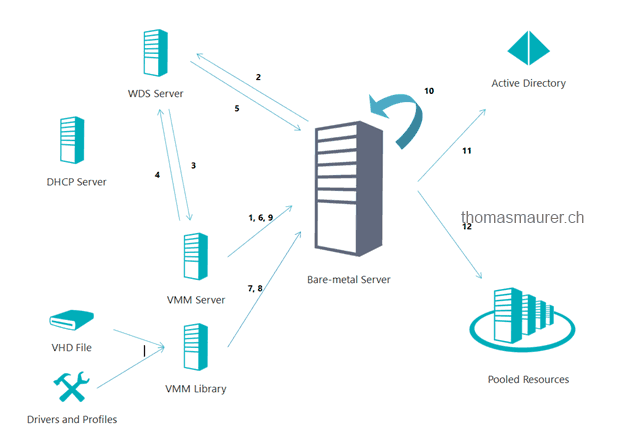 System Center Virtual Machine Manager brings a cool new feature called Bare Metal Deployment. This feature allows deploying new Hyper-V hosts via Out-of-Band Management (IPMI or SMASH) with the Virtual Machine Manager. In my lab environment I use Cisco UCS C200 M2 servers as my Hyper-V servers but this guide will also work with servers from other vendors such as HP, IBM or Dell. 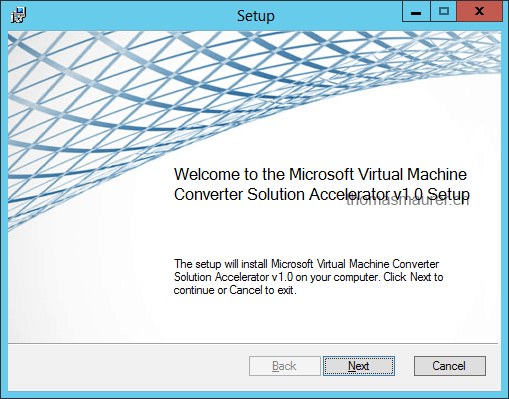 Back in April Microsoft announced the beta version of the Microsoft Virtual Machine Converter Solution Accelerator. The Microsoft Virtual Machine Converter allows you to migrate your VMware vSphere Virtual Machines to your brand new Microsoft Hyper-V environment. 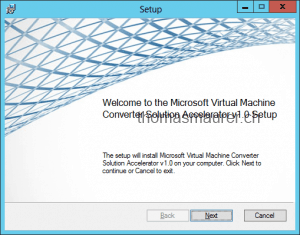 Today the Microsoft Virtual Machine Converter Release Candidate is available for testing. The best thing at the RC is the support of Windows Server 2012 Hyper-V and Microsoft Hyper-V Server 2012, but there are also other new capabilities.